The Cherryman Industries team never fails to impress. Just ask any interior designer, shopper, or furniture specialist that's checked out their popular Amber collection! This full service line of executive office desks, expandable conference tables, reception stations, and office storage solutions offers an unrivaled combination of value and appeal. Today on the OFD blog we'll take an in-depth look at the Amber collection and the products that have skyrocketed it's popularity. Cherryman is ready, willing, and able to hep you craft an elite interior that won't break the budget. The products from their Amber collection are available in 5 quick shipping finish options including walnut, and out personal favorite, black cherry. While traditional tones like maple are available, Amber sets itself apart from competing collections with elegant laminate finishes that make it easy to think outside the box. The office desks from the Amber collection are available in stand alone, L shaped, and U shaped variations to meet the needs of any space. While individual components are available to help users craft custom work environments, the pre-configured sets are really the way to go. Popular Cherryman Amber desk layouts take the guess work out of the design process. They offer all of the components needed to maximize square footage, appeal, and organizing potential. We can't say enough good things about the conference tables from the Amber line. If you're familiar with the furniture world, you'll know that 2016 has been all about modular versatility. 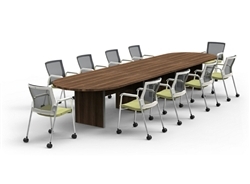 The affordable conference room tables from the Amber collection boast expandable tops that really come in handy. During larger group gatherings simply add a section and you're ready to roll. There's no need to purchase a whole new table as your business grows. Tables like the AM-411N come standard with the surface sections needed to craft a 16' long modular table for just $962.00. By industry standards that's practically unheard of. Make a great first impression on your guests without breaking the budget by integrating a reception station from the Cherryman Amber collection. 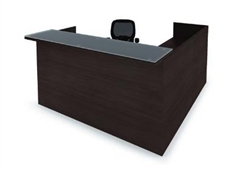 Amber stations can even be crafted to accommodate multiple receptionists! Units like the AM-404N boast ample operative space and the visual design characteristic needed to rock you reception area. Smaller Amber reception area welcome desks like the AM-400N come with attractive glass transaction counters that really pop. 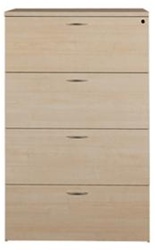 At just $1002.00, it's hard to deny the value provided by this best selling furniture collection. Cherryman is no newcomer to the office furniture scene. They know that for a collection to be successful, it must have the storage components needed to help users operate at their best. The Amber product line offers a wide range of executive office bookcases and low all cabinets that provide ample storage space while simultaneously boosting corporate appeal. Smaller desk side pedestals are commonly available in Amber desk sets that provide at-hand document storage. The Amber collection even includes larger lateral cabinets for workers with heavy filing needs. It's hard to give the Amber furniture collection from Cherryman Industries anything other than a 5 star rating. There's nothing to overly criticize about this best selling line that would warrant a deduction. Amber offers unrivaled value and plenty of finish options to choose from. The desks, tables, and reception stations from this collection typically ship from one of 4 U.S. locations within 2 business days of order to help meet tight project deadlines. The wide array of modular components can even help users craft custom interiors to maximize their specific floor plans. To make a long story short, Amber is the real deal. Literally!